I am the only server on duty in a restaurant with many rooms on many levels. The hostess seats a party and I take their drink order. Then she seats another party and I take their drink order, then another, and another and another…. What’s my dream got to do with anything? Zucchini, that’s what. The zucchini keeps coming, and coming and coming! Those fertile plants just keep popping out beautiful, shiny, perfectly formed fruit and I just can’t do them justice. I go out, greet them, take their drink order and leave them to pile up on the table, neglected and thirsty. I’ve already frozen tons to use in the winter (bulky in the freezer), I’ve made ratatouille for now and later, I’ve eaten them fresh a bunch of ways, made zucchini bread and still it just piles up. Note to self: next year two zucchini plants is plenty! Don’t let me sound ungrateful or anything, zucchini was my first reassuring gardening success this year, so it’s earned a special place in my heart. I’ve been seeking ways that excite me to put up the rest of this harvest, and everything’s just been leaving me kind of uninspired. I don’t really enjoy zucchini pickles, relish or chutney, so to go through the steamy hassle of putting them up just so they can hang out in my basement doesn’t do much to motivate me. One thing I’m learning is to pace myself for the keystone projects that keep my kitchen running. I don’t want to waste energy, ingredients and jar space on stuff I don’t eat and am not excited to gift. Then I remembered Eugenia Bone. Why don’t I have a cool name like Eugenia Bone I ask? Oh well, I’ll get over it. Eugenia’s book Well Preserved is a good one. I originally bought it for the home canned tuna recipe that I still have not tried but get excited about every time I read it. I love canned tuna. Meow. Somehow when I first read the book, this unassuming recipe for zucchini slipped my memory. But today, this elegant recipe gave me my desperately needed eureka moment. See how ideas germinate in serendipitous ways? 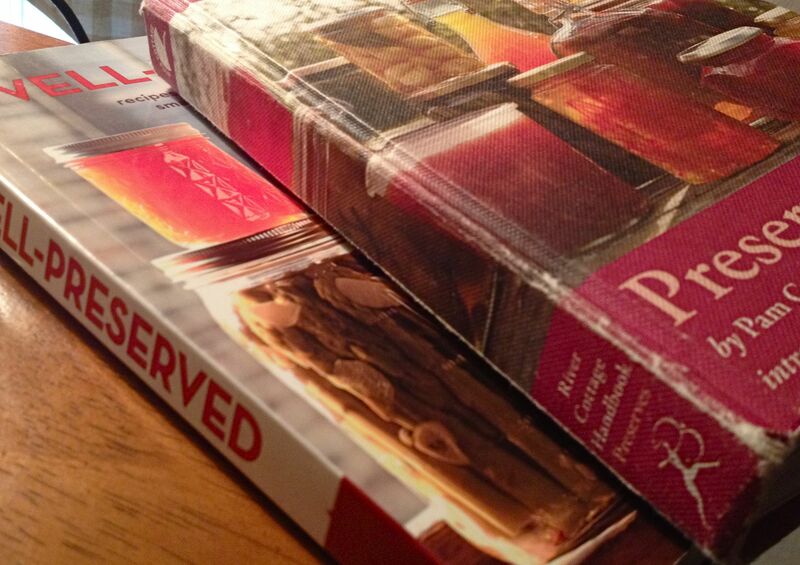 Eugenia’s recipe is good, but marry it to Pam’s? Even better. Pam’s has the added step of resting the grilled veggies in a diluted vinegar bath before preserving in oil & lemon juice that gives it just a perfect bite of extra acid and tang. And while the veggies are good, the oil is valuable in its own right – as the veggies, garlic & peppercorns age, their oil bath not only preserves the veggies, it develops a delicate, smoky flavor and is delicious on pasta, bread, salad dressings and drizzled over grains. That I am a kitchen gambler I don’t deny: here’s the disclaimer. This recipe is my own hybrid – click here to check it out. I made it yesterday and since it’s a recipe with a goal of aging, I don’t know for certain how the zucchini will hold up to the test of time. The peppers I made this way kept beautifully, way beyond the time the National Center for Food Preservation would advise you is safe. I tend to be a bit bold that way. Since the recipe is an adaptation from one intended for asparagus, zucchini isn’t a far stretch, is it? Zucchini is more tender and succulent than either peppers or asparagus, but I believe that by slicing the planks thick enough to stay firm yet not too thick to soften they will retain their limp shape for several months. A little under ¼” feels just about right. Only time will tell. Eugenia Bone claims the oil preserved zucchini is good for 10 days in the refrigerator, Pam Corbin puts hers in sterilized jars and keeps the jars in a cool, dark place for up to 4 months. Once opened, Pam recommends the jars be kept in the fridge, making sure the vegetables are completely covered with oil and used within 6 weeks. You can be sure I’ll be pushing the envelope. That being said, I’m keeping mine in the fridge. And what will I make with my soft, oily, delicately flavored zucchini planks? This is where Eugenia really grabbed me. Pasta with preserved zucchini and tomatoes anyone? How about some shrimp and preserved zucchini salad? Wow. Maybe a bruschetta of chopped preserved zucchini spooned onto toasted baguette? But for me? This is the one that got my full attention: Mozzarella chunks wrapped with preserved zucchini and sprinkled with coarse salt and freshly ground pepper. Fresh basil leaves optional. Pass the crusty bread please…. 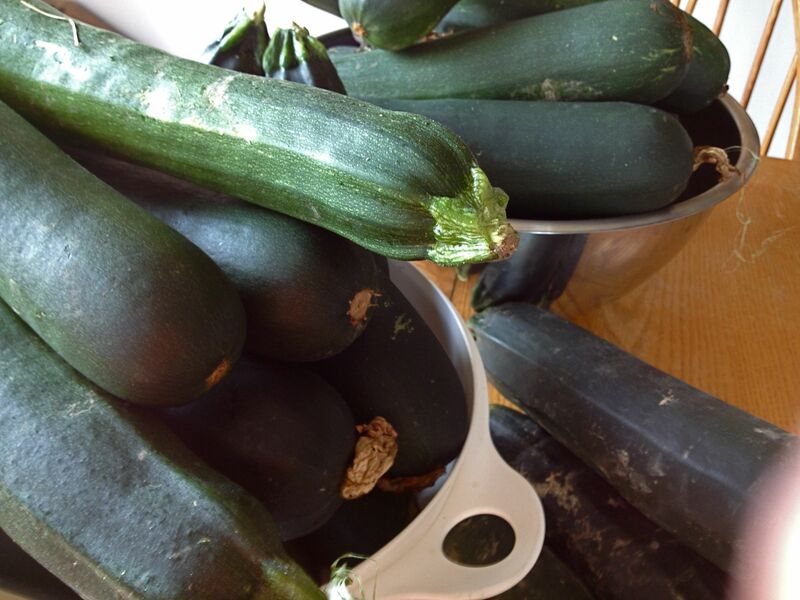 What awesome things did you make with your zucchini bounty this year? I always make mock apple pie when i have lots of zucchini coming in, just take a nice big one, peel, seed and slice and make your regular pie dough and the regalar apple spices/filling, it good and no one ever thinks its what it is, but I put most of my extra’s up as the mock pinnappe. Thanks for the great links… hope to squeeze that pie in soon! I love that lasagna idea too. I never knew marrow was overgrown zucchini – I’m anxious to stuff one of those too, and do some blossoms before the plant croaks. Those are just the prettiest little roll-ups ever. I think we may have made through the season but marking this one for next year. 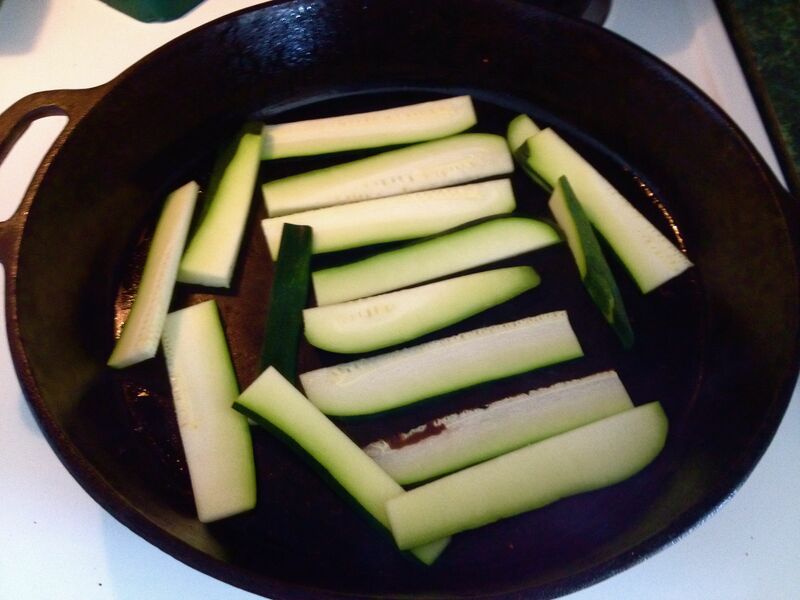 One of my readers, Montucky had a funny joke that in his small town the only reason that they lock their cars is so that no one will fill them with zucchini. ….not glorious? ….i’ve had that same dream. over and over and over and over again. i can’t get to my tables. no one will help me. the restaurant is just too big. nothing will ring into the posi-system. stuff isn’t being made. i call them serving-mares and i fear that i will never really be free from them. i always wake up a little out of breath, out of sorts, and out of solutions. stupid serving-mares. Trying to find a way to can zucchini! This is a good thought. Love marinated stuff in EVOO. 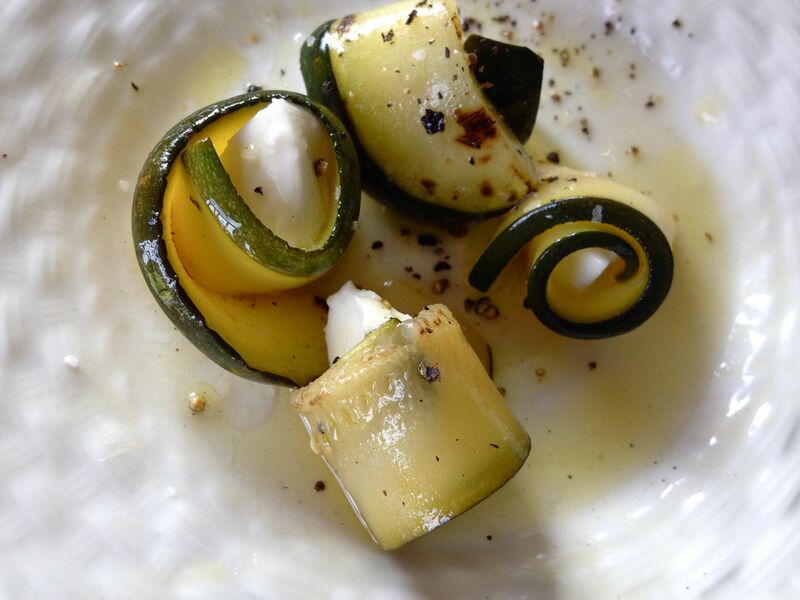 I keep seeing great recipes for zucchini preservation, but many of them have garlic in olive oil. This puzzles me as there is a very definite warning from science sites that say garlic in oil can harbor botulism. There can be botulism in the soil that gets on the garlic, and it needs to be processed at temps higher than 154 F in order to kill it. regular canning cannot do this. Hi Nancy. You’re talking to a girl who has ingested plenty of dirt, manure and pathogens in her life so I tend to not be overly fearful to start with. What can I say? I’ve been eating peppers preserved in oil, cheese in oil, asparagus in oil, artichokes in oil and now zucchini in oil for a long time. And none of them are the same without the lemon juice and garlic. I also started using European books for reference long ago and their techniques are often not USDA approved. They became habit for me before I started consulting food safety sites so if I trusted the source of the recipe, I was okay with the process. There are many traditional foods in Europe that are banned by the FDA here – egg handling is much more nature based, raw milk cheeses may be sold fresh, cheese can be aged on wooden boards, and the techniques for putting up preserves are very different and often don’t use even a water bath. 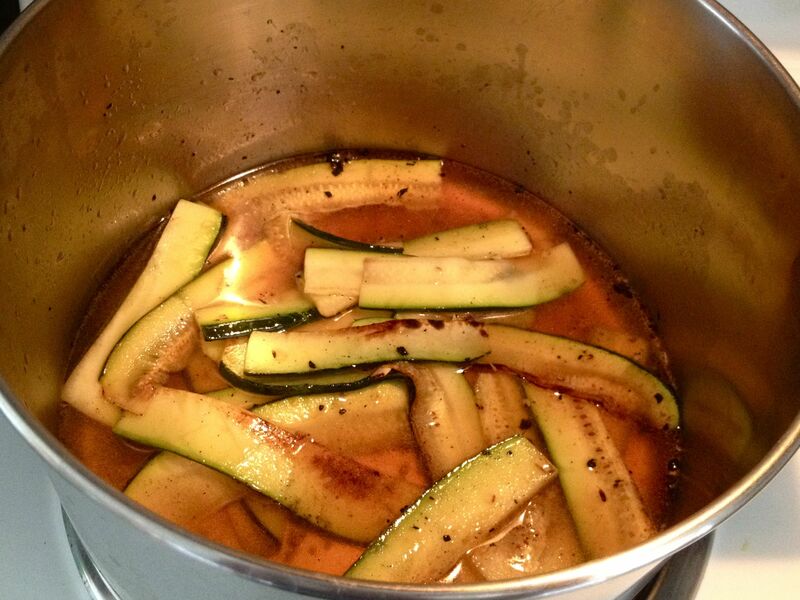 This recipe however dunks the zucchini into a hot vinegar bath. If you wanted, you could use that as your opportunity to bring the garlic and zucchini to temperature before putting into sterilized jars. I am really picky about hygiene when it comes to opened jars. No fishing out with the fingers, no double dipping and opened jars are stored in the refrigerator. If it makes you uncomfortable, I’d say pass. There’s no shortage of good recipes for zucchini. I realize this is not exactly a satisfactory answer Nancy. I am no scientist. I tend to trust in the balance of pathogens rather than the elimination of them and knowingly stretch the “rules” at times. So often in agriculture, when you isolate scientific data to study one single issue, you are often missing the larger picture. I am more afraid of Purell than botulism in my soil, though I have no doubt it may be there. I’m inclined to agree on this issue. We have eaten plenty of supposedly unsafe food in our lives, right from our local grocery store or neighborhood restaurant. We have eaten bleached bugs in commercial white flour, drowned roaches in commercially canned tomatoes, etc. I feel fairly sure that most of us have already had salmonella as well. 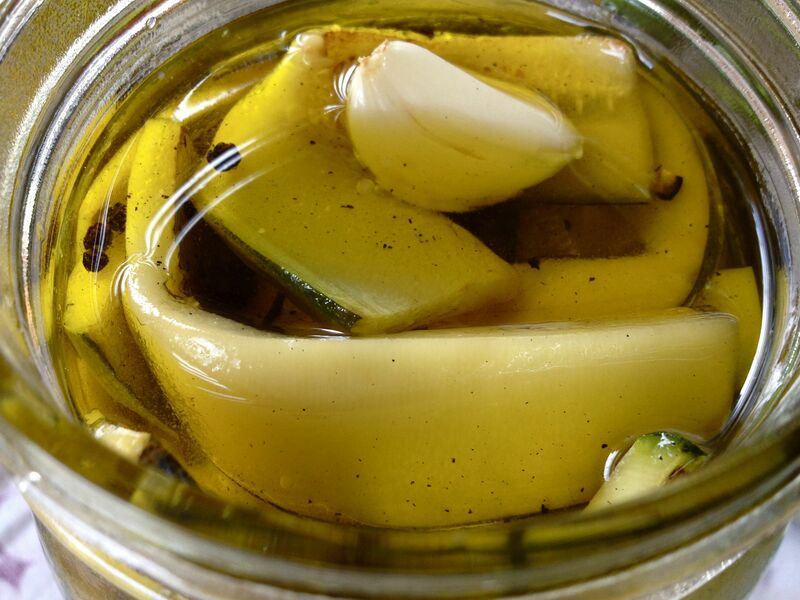 Italians have been preserving garlic in oil for a long, long time. I read that USDA warning, too. I dismissed it as having about as much validity as their food pyramid. Thanks for the visit and the comment. I wouldn’t say I dismissed it, but it seems that the FDA won’t be satisfied until we’re all living in a plastic bubble. Having pondered this further, boiling the garlic in the vinegar and maintaing the temp before proceeding to the next step is the way I plan to make this next time. Hmm. Living in a plastic bubble might protect us from the horrible pollution around us. A little spider or moth DNA and maybe we could each weave our own bubbles while watching tv. Pardon my wry sense of humor, but I think we live in crazy times, and the only way to not go crazy yourself is to laugh. I have read of the raw milk vending machines Linda. Interesting idea, like those fermenting peppers.